All birds preen to keep their feathers in top shape. Birds have up to 25,000 feathers, and regular preening keeps each one of those feathers in top condition. Second only to feeding, preening is a common bird behavior easily observed in a yard, out in the field, or even among captive birds or pets. Understanding why and how birds preen can help birders better appreciate their beautiful avian friends. Preening is a bird's way of grooming its feathers to keep them in the best condition. 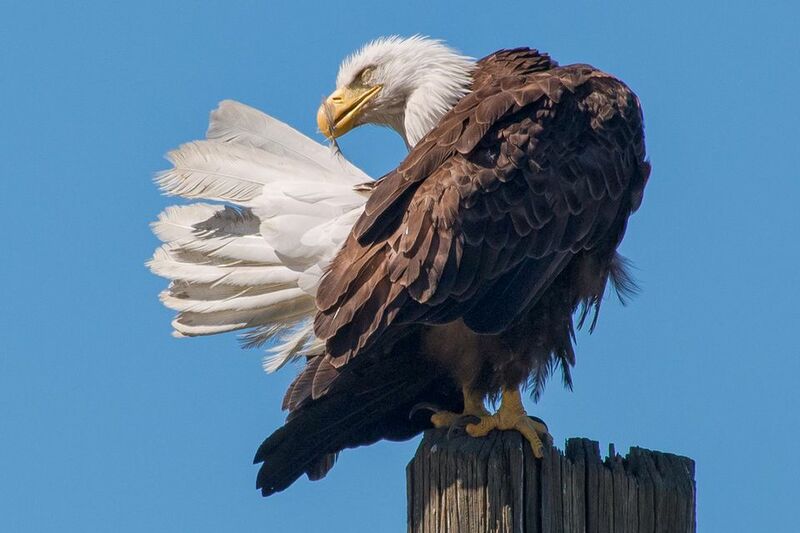 While preening, birds remove dust, dirt, and parasites from their feathers and align each feather in the optimum position relative to adjacent feathers and body shape. Most birds will preen several times a day to keep themselves healthy. The uropygial gland, or preen gland, is an essential part of preening. This gland is found near the base of the tail and produces an oily, waxy substance that helps waterproof feathers and keep them flexible. While preening, birds spread this oil to each feather so they are evenly coated and protected. Some types of birds, including owls, pigeons, parrots, and hawks, lack a uropygial gland. Instead, these birds have specialized feathers that disintegrate into powder down, which serves the same purpose as preen oil. Birds that produce powder down are less likely to bathe or immerse themselves in water and do not require the stronger waterproofing that preen oil provides. Moisturizing feathers with preen oil so they are flexible and strong, instead of brittle and easily breakable. This helps feathers better withstand the stress of flight. Aligning feathers for optimum waterproofing and insulation to protect against adverse conditions, such as soaking or extreme hot or cold temperatures. Dust Bathing: Many birds, particularly game birds and sparrows, that will take dust baths as part of their regular preening. The dust helps dislodge parasites and absorbs excess preen oil so feathers are not too heavily coated. Birds that do not bathe in water are more likely to use dust baths frequently, but many birds will use both types of bathing. Sunning: Sunning helps birds control body parasites and feather mites by moving these pests around to different areas of the body where they can be nibbled away. Sunning can also make the oil from the preen glad more liquid and easier to spread to different feathers in a thin, even layer. Bathing: Many songbirds will bathe in water before engaging in extensive preening, splashing around to moisten all their feathers. Bathing removes dust, dirt, and parasites from feathers before birds work to put each feather into its proper position. Stretching: Extensive stretching helps provide space between each feather so the entire feather can be stroked and groomed effectively. Stretching or fluffing also helps birds align all their feathers after a section has been preened. Anting: Some birds will lay on an anthill or rub ants over their bodies while preening. This process, called anting, distributes formic acid from the ants' bodies onto the birds' feathers. This is believed to help inhibit parasites that can damage feathers. While preening is essential for birds' health, it can also be dangerous if birds are affected by other hazards. Oiled birds, for example, will preen excessively in a desperate attempt to rid themselves of the sticky residue, and in doing so they ingest the toxic oil. This can quickly lead to poisoning or other contamination if the birds are not properly treated. Similarly, fishing line is hazardous to preening birds. If a length of monofilament line is caught in a bird's plumage, it may become wrapped around the bird's bill while preening. This can inhibit the bird's ability to eat and may cause starvation, or the bird could inadvertently tighten the line while preening and cause injuries. Some birds have difficulty preening each part of their body, and may develop bald patches if they cannot preen effectively. In the case of many crested songbirds, such as cardinals and blue jays, this can lead to temporary baldness that can be startling, but the birds will regrow their head feathers very soon. While the exact causes of bald birds are complicated, preening difficulties are one possible factor. Birds must preen regularly to stay in the best health, and preening is a common behavior for birders to observe. By understanding how and why birds preen, every birder can better appreciate what it means to be a bird.